Clemmys guttata, also known as the spotted turtle because of yellow spots on their shell is a small turtle species. The skin and shell of this species are black with yellow or orange spots. 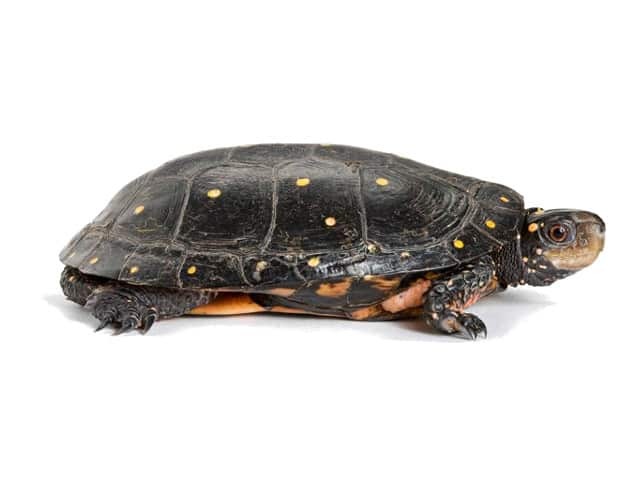 Female spotted turtles have yellow eyes and jaws. Males have red eyes, gray jaws and a concave plastron. Male spotted turtles also have a longer, thicker tail and the cloaca is further removed from the base of the tail, compared to the females. Because of Clemmys guttata small size and gentle disposition a tank size of about 0.8 x 0.5 x 0.5 meters (2.6 x 1.6 x 1.6 feet) is sufficient for one spotted turtle. It is also possible to keep this species as a group in a larger tank. Male spotted turtles are aggressive towards each other and should be kept with females or alone. Plants, pieces of wood and rock can be used to provide hiding places for the turtles. These structures are also used to climb to the surface to take a breath. For substrate I recommend river sand. The basking area needs to be dry so the turtles can get completely dry. Some form of shelter to hide the turtle from sight while basking is appreciated by this species. Above this area a basking spot has to be present so the animals can raise their body temperature. Directly beneath this spot the temperature needs to reach at least 35 °C (95 °F). A water temperature of 22 °C (72 °F) is sufficient. Also provide a source of UVB (and UVA) light so the animals can produce vitamine D. This enables them to absorb calcium from their food. In the fall the keeper can slowly start lowering the number of light hours and the temperature. I hibernate mine at 4 °C (39 °F) for 4 months. At the end of hibernation, raise the temperature and light hours slowly and the animals will start to become active again. It is very important to take under consideration that hibernation always poses a risk to the animals and should be done with great care by a keeper who knows what he/she is doing. Clemmys guttata are not very strong swimmers and prefer shallow water. A water depth of 0.2 meters (0.65 feet) is recommended. For filtration a biological filter or pond filter is suitable. Use one with a capacity of 1- 1,5 x the volume of the tank. The recommended pH level of the water is 6-7. When the temperatures drop the animals get sluggish and can not swim as well. It is important that the water level is not too high and that the turtles can use plants/wood or have enough grip on the wall of the enclosure to get to the surface for air. Clemmys guttata are omnivores, they will consume both animal and plant matter. In nature spotted turtles eat small aquatic prey animals like tadpoles, insects and their larvea, fish and newts. They also consume carrion, algea and several kinds of aquatic plants. I try to mimic this diet as much as possible. My animals are fed small freshwater fish, freshwater shrimp, woodlouse, worms, mealworms, waxworms, crickets, phoenixworms, cockroaches, endive and aquatic plants. Pieces of sepia are always available for the animals to nibble on when they feel the need to ingest extra calcium. Like most reptiles, they do not like being handled. However, handling will be necessary to conduct periodic health checks. Hands should be clean before handling and washed after handling them and their environment. Clemmys guttata are not very messy turtles so with a good potfilter cleaning the tank does not require much work. Besides the filtration, I use live plants and I recommend water changes once a month in order keep nitrates low (less than 10 mg/l). The mentioned tank dimensions is a minimum size to house 1 animal comfortably. The water changing regime should be based on the situation. If a keeper sees that the tank get dirty sooner (because of the filter/the food that is offered, etc), then the water should be changed more often and/or add a bigger filter. Clemmys guttata are a hardy species of turtle. They don’t get sick easily. Of course they need appropriate care, just like any other turtle. For optimal health of the shell they need a good quality basking spot and exposure to UVA and UVB light.